If you are a frequent visitor around here, then you know my love for First Aid Beauty. If you are a newcomer, welcome. Heyyyyyyyy. And you should know that I absolutely adore First Aid Beauty products. Click here to read all my past posts. They recently launched some new products and I've been testing them out for a few weeks and wanted to introduce them and give you my thoughts. 1. 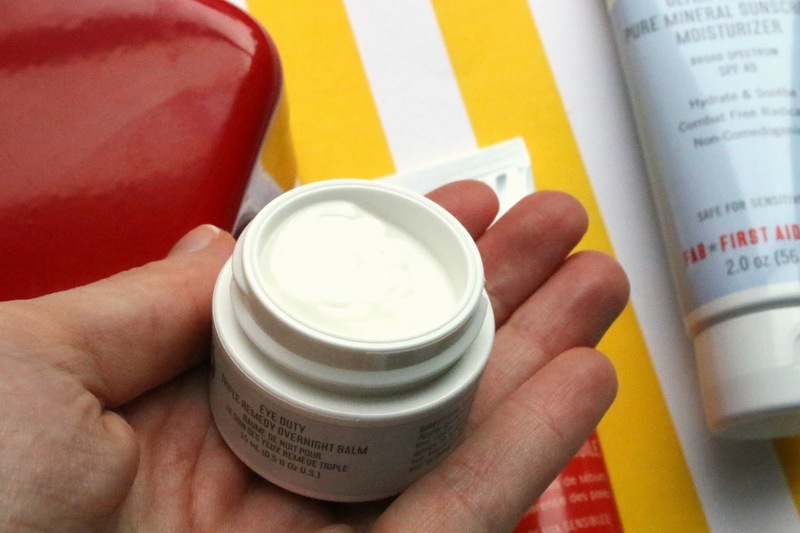 Eye Duty Triple Remedy Overnight Balm - I adore this eye treatment for the day (soooo great for puffiness and dark circles), but this overnight balm is in an entirely different league. It's intensely rich and nourishes the driest of eyes. What makes this stand apart from many of my other eye creams is its ability to be used both around the eye and on the eye lid! It's nice to have a treatment for the delicate eyelid skin and this has helped keep my eyes moisturized and soothed. I definitely recommend using this overnight (as is intended) since it can be a bit too rich for during the day. But it has been a lifesaver for those being spring allergies that have crept up and decided to dry my eyes out. Rude, but I love the nice weather so all is forgiven. 2. Oil-Free Mattifying Gel - If there is one product that instantly drew me in, it was this one. Being an oily skinned gal, I am always on the hunt for great mattifying products. This Murad mattifier is already my holy grail so I was skeptical if this could live up to that. The texture has a bit more of a silicon feel to it than my Murad, but once it's on the skin it absorbs in immediately. My skin felt clean rather than heavy with product and it gave me a gorgeous natural matte finish. The important part of that being "natural" because so many mattifying products can make skin look dry and lifeless, whereas this still allowed the natural glow of skin to show through. Summer humidity does not stand a chance with my face. I feel super prepared now. 3. Ultra Repair Pure Mineral Sunscreen Moisturizer SPF 40 - Summer is right around the corner *throws confetti*, so I am always up for adding a new sunscreen to my routine. The texture of this one definitely mimics the cult classic Ultra Repair Cream with its richness and thick formula, so I only need a small amount to adequately cover my face. However, even though its a rich cream, it feels weightless on the skin. As has been my experience with most FAB Ultra Repair products - they can tackle the driest of skins but are comfortable even on those that are oily and combination. I think this would make a perfect year round staple sunscreen, and wears fine alone as well as under makeup. 4. Vitamin Hydrating Mist - I love to mist. After toning, before makeup, after makeup, mid-day - there is never a bad time to mist. It's like an instant pick-me-up, right? I was excited to see that First Aid Beauty finally released a facial mist because their products tend to be some of the most hydrating and moisturizing I have ever tried. I knew if they did a facial mist I would love it. And yes, I do. It's refreshing and revitalizing because it's chock full of vitamins and antioxidants, and I feel it wakes my skin up. Of course, it doesn't matter what's in the bottle if the spray nozzle dispenses it incorrectly. Thankfully, it sprays in a fine mist that dampens the skin without leaving the face soaking wet.